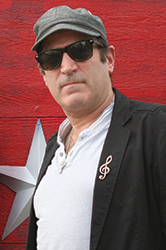 John Torres, a Philadelphia/New Jersey performer and songwriter who has been actively creating his own music since the late 1970’s to present. Over that period, John performed with his band Coup d’état in Philly, NJ, NYC and other places along the East Coast as well appearing live on local radio. In the early 1990’s, Torres got the opportunity to record his first solo EP through the help of Lou Lipshitz. At this time, Torres teamed up with the legendary Peter Humphreys and released John Torres In Three Flavors. In the spring of 2000, Torres co-wrote 3 tracks on Katie Drake’s 10 songs CD, Complicated in which 2 songs received airplay on WXPN in Philly and other radio stations across the country. John got the opportunity to write and record songs with the legendary singer/songwriter/performer Bunny Sigler. John also has 2 more writing credits on the 2004 release of Carla Gio’s CD, About Time, featuring the song “Watching You Walk Away” was played on Delaware’s WSTW 93.7’s Hometown Heroes program and WXPN 88.5. In 2004, Torres released his first self-produced full length CD, Songs From The Curbside Of A Small Town. Torres received local radio airplay including WSTW Hometown Heroes. In 2006, one of his songs, “One More Chance”, was selected and chosen for the Philadelphia Songwriters Project Choir Competition. A live performance CD has been released and “One More Chance” has received the most selected plays on the Philadelphia Songwriters Project website page. On March 3, 2011, John released Any Color at The Legendary Dobbs on South Street in Philly. On this project, he had the opportunity to work with producer and drummer extraordinaire Daoud Shaw at Radio Active Productions; credits include Van Morrison and many others. The 7 song EP includes John’s interpretation of the Beatles song, “Baby You’re A Rich Man” recorded with Brad Scheurer and Joe Lam at Aqua Lounge Studios with the John Torres Band. This is the first single released and now included on the EP. The EP is a combination of the John Torres Band and featured artists. John describes his sound as South Jersey, acoustic guitars, a little slide, woodsy violins and some progressive soul voices that have spilled over from the Ben Franklin Bridge eastbound to the shorelines.